A super-clear, high-gloss polyester film that provides an excellent glossy finish to virtually any output. Uniquely suited for high-ink coverage prints on photo-gloss paper. 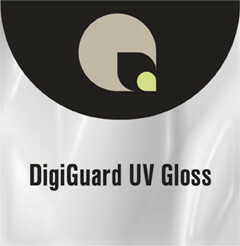 Digi Guard Gloss 5 mil/10mil have a higher adhesive content than Hard Guard allowing for better flexibility and lower cost. It’s perfect for mounting multiple images to a single board, and allows the images to be flush-trimmed or die-cut -- and rolled almost immediately after processing -- without fear of delamination. It’s suitable for single- or double-sided applications and features an ultra low-melt adhesive system and UV inhibitors.